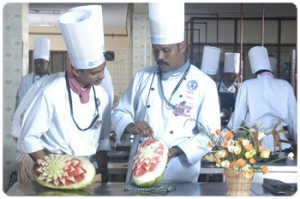 Hotel Management is one of the leading catering institutes in India offering Under-graduate, Post-graduate and various Diploma courses in Hotel Management and Catering Technology. There are four major departments in Hotel Management Namely Food Production, Food & Beverage Service, Front Office, and Accommodation Operations. A student who studies in this institute can equip himself professionally in all these major subjects and choose one as his career in the hotel industry. 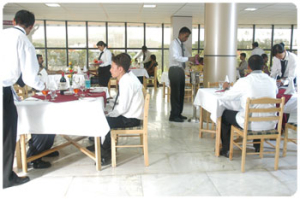 The objective of the school is to make the student concentrate on all – round development and inculcate in him the importance of acquiring multi – skills which is the need of the hospitality industry in this new millennium. 1 Year Certificate Course in Food Production, Bakery & Confectionery, Front office, Food & Beverage Service, House Keeping. 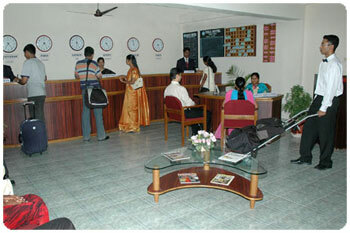 Lateral entry for 3 years Diploma in Hotel & Catering Management to II Year B.Sc Hotel & Catering Management. The students of the Second year degree and diploma are trained in this kitchen. It is here that the students are taught to prepare food in bulk quantities. The cuisine is commonly Indian, though it does concentrate on other global cuisines as well. The students of the final year work in this kitchen. The advanced level in cookery is taught and practiced here. Cuisines like Mexican, Chinese, Thai, and Mediterranean are prepared and skills like Ice carving, Vegetable carving, Tallow carving, etc are imparted to the students. 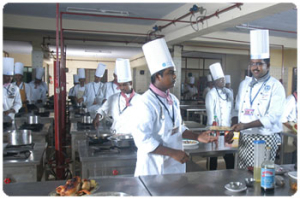 Here the students are introduced to the basic principles of cookery and are trained to cook food for 2 portions. The students of the first year degree and diploma train in this kitchen and generally the cuisine taught would be French. In this department students are taught to organize, perform and evaluate the front office functions that are critical to the success of a hotel and trained to handle the diverse procedures of front office operations and management. The University has a Guest house having single room and a double room similar to the standards of five star deluxe hotels for the students to train in the art of bed making and room cleaning. This department also has a practical lab and a laundry for the students to learn laundry services and flower arrangements. Hotel Operation Trainee in a core Hotel Department. Executive in Multinational and Local Quick Service Restaurants. Hospitality Marketing/ Sales Executive in Hotel and other Service Sectors. Executives and Supervisors in Resorts Spas. Ground and In-flight staff in Airlines. Executives and Managers in Event Management Operations.